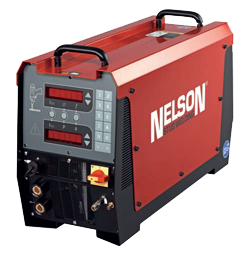 This high performance and light-weight stud welder delivers power and precision when stud welding. It can weld up to 3/4" (19mm) full diameter fasteners, and only weighs 79 pounds. The friendly user interface has 10 preset buttons, bright alpha-numeric displays, graphic gun, and weld quality indicator. Its simplicity reduces set-up time, operator training, and error. 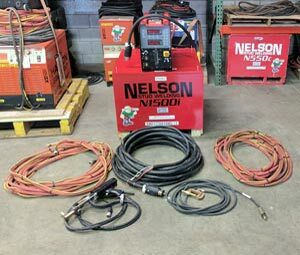 This welder incorporates the standard features of the Nelson Stud Welding equipment family, such as STUD EXPERTTM and PROCESS MONITORING. The pulse waveform feature cleans surface contamination, and makes Aluminum welding perfect. Optional integrated gas controls allow precise metering of shielding gas when using the gas arc process. Ships at just 410 lbs in a custom padded crate. 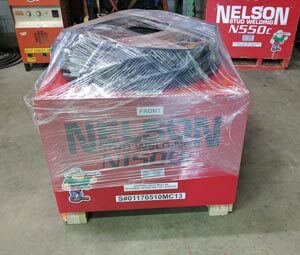 Let our Nelson experts provide recommendations for your project or application.